Lighting A Revolution: Ink Blotter 172, "Have you electricity in your house?" Blotter number 172; image number: LAR_B172. "For sale or to rent. Inquire within." The decision whether or not to adopt electric lighting in a given building often hinged on the expense of installing wires. Nineteenth century construction techniques made adding this new infrastructure difficult and expensive. Thus the very important question posed by the prospective home buyer in the above blotter. 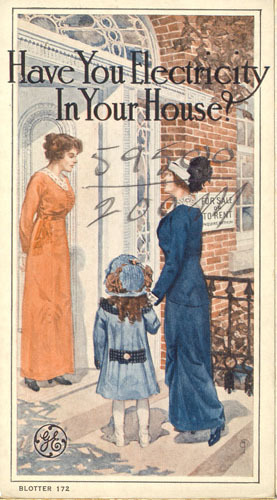 The advertising strategy was to make home owners consider the value electrification added to their property. In homes, wires tended to be installed on the surfaces of walls and ceilings. Sometimes these would be concealed inside wooden moldings, but often they would be tacked up with wooden or porcelain cleats. Though the wires were insulated they could be damaged easily, resulting in a fire. Occasionally, installers took a short-cut and ran wires through the pipes that supplied fuel to gaslight fixtures. This had the extra advantage of allowing the customer to have a combination fixture that could use either gas or electricity, electric service being erratic in the early years. Modern electricians still find these very dangerous installations in older buildings from time to time. A typical room, especially in rental properties, had only a single lamp socket installed. As wall outlets were not developed until the years around 1910, early appliance cords came with screw-in plugs. The user either removed the light bulb and powered the appliance from the light fixture, or installed an adapter that allowed both lamp and appliance to be used at once. Fires caused by inadequate wiring led to the establishment of Underwriters Laboratories in 1894 and the adoption of the first National Electric Code three years later. The handwritten notation "59500 / 200M" on this blotter is a counting mark, not a museum marking. Apparently 200,000 blotters of this type were ordered. As the blotters were packed for shipment, this blotter happened to be on top of one stack and became number 59,500 in the print-run. Terrell Croft, Wiring For Light and Power, (New York: McGraw-Hill Book Company, Inc., 1920). National Fire Protection Association, National Electrical Code. The first edition of the NEC was published in 1897 and updates have been issued every few years since then. Melissa L. Cook and Maximilian L. Ferro, "Electric Lighting & Wiring in Historic American Buildings: Guidelines for Restoration & Rehabilitation Projects," in Technology and Conservation, Spring 1983, p.28.